At least seven people have been killed and dozens more wounded in a bomb attack in Gaziantep, south-eastern Turkey, security sources and media say. 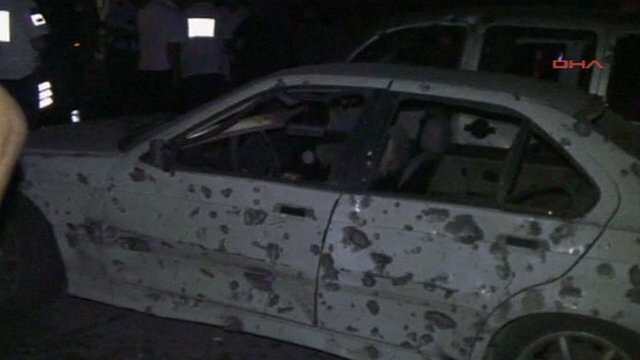 The suspected car bomb exploded close to a police station in Gaziantep, Turkey’s Dogan news agency reported. Police officers were reported to be among the casualties and media showed a bus and other vehicles on fire. However, rebels from the outlawed Kurdistan Workers’ Party (PKK) are active in south-eastern Turkey, which has a Kurdish majority. Gaziantep’s governor Erdal Ata said the explosion had been caused by a remote-controlled car bomb, the Dogan agency said. Earlier on Monday, two Turkish soldiers were killed and another wounded in a mine blast in south-eastern Hakkari province. Turkish officials blamed the attack on the PKK. Clashes between the PKK – which seeks autonomy for the Kurds – and Turkey’s armed forces have increased in south-eastern Turkey over the past year.